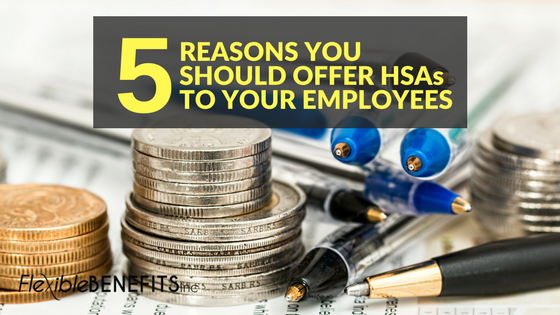 5 Reasons You Should Offer HSAs to Your Employees – Flexible Benefits Inc.
What is a Health Savings Account? A Health Savings Account, better known as an HSA, is a personal employee owned savings account. HSA’s are established when an employee has selected a high deductible health plan from their employer’s sponsored health plan offerings. Health Savings Accounts help an employee to save money to pay for medical expenses like when visiting their doctor, dentist, or ophthalmologist. If you’re a business owner and are considering offering HSAs to your employees, below are a few reasons to consider. .
A benefit of a Health Savings Account to an employer is the tax savings you will earn. Neither the business owner nor the employee is obligated to pay payroll taxes on HSA contributions deducted through payroll. You will immediately get a federal income tax deduction for any contributions you make into your employees’ accounts, as well as for the amounts they contribute with payroll deduction. Who can honestly say they don’t enjoy tax savings? Not us. Health Savings Accounts have to be paired with a HSA-qualified health plan. These types of plans have minimum deductibles that are usually higher than traditional health plans, but the premium rates tend to be low in return. If you empower employees with the option to save on their taxes and give them more purchasing power, while also providing the means to invest in their retirement, you will make a convincing case for an employee to stay with you for a long period. By offering benefits like HSAs, companies may see less of a turnover. Employee earnings on invested HSA contributions are tax-free, which means the account works like a medical IRA or 401(k). However, it differs from these accounts because the funds are never taxed if they are used for qualified expenses. This could benefit employees with their long-term retirement goals. Employee taxes can be reduced by contributing to a Health Savings Account and this tax-free money can help pay for qualified medical expenses. If payroll deduction is allowed for the account on a pre-tax basis, employees will get access to the full amount saved from each contribution. As you can see, there are many benefits to offering Health Savings Accounts to your employees. Not only will it be beneficial for you as the business owner, but your employee will reap benefits as well. Your next step should be looking into the right HSA provider for your business. If you want to know more about HSA options for your workplace, Flexible Benefits, Inc. is here to help you. Give us a call today and let us show you what using this great benefit can do for you and your staff. Contact us at (251) 237-1115 or toll-free at 1-888-821-9007.